I love creating, I always have and it’s hard to say where it all comes from sometimes. Often it’s a subconscious thing. The inspirations for this collection were twofold. Firstly the beads, gems and findings I source, and which I am constantly obsessed with! They simply ignite creative ideas that I have to explore and experiment with. Much time is spent searching out unique materials, to lend a unique character to my work. Secondly, and there’s always an element of this, Brides inspire me. Meeting and working with brides I get to learn what it is they are searching for, working on bespoke designs for them never fails to teach me where I should be evolving my designs. Inspired by light and reflections, and the kaleidoscope of pattern that fills my mind. It's a small collection comprising stand alone statement pieces plus a selection of smaller pieces that offer limitless possibilities for combining and styling together. 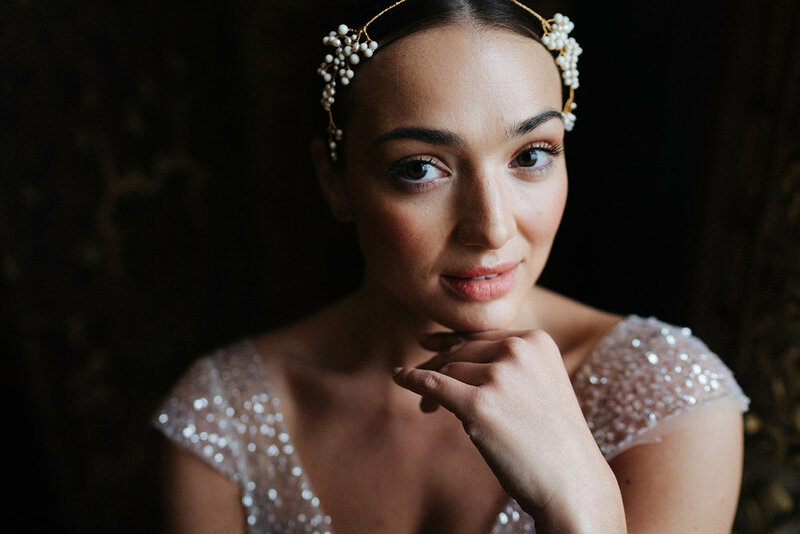 Brimming with intricate hand embroidered details and featuring muted metallic tones, seed pearls and the unmistakable sparkle of Swarovski crystal. I’ve been fascinated with beads for as long as I can remember, so my job is born out of a passion and obsession, which makes me very lucky. I work from a small studio in my home, where I am surrounded by all my beading paraphernalia; threads, fabrics, pack upon pack of Swarovski crystal, strings of freshwater pearls and little pots of seed beads. Creating the finer detail of a brides wedding day ensemble is a privilege, as I really believe it’s these finishing touches that make all the difference and they become the treasured keepsakes from such a special day. Every bead, sequin, and gem is hand stitched, and I’m a perfectionist with the keenest eye for detail so your finished accessory is a small work of art. I studied at The London College of Fashion graduating with a degree in Costume and Make-up for the Performing Arts. So, I am fully trained and equally happy handling your make up and hair needs, and / or accessory embellishments. A stunning range of accessories inspired by the lush and exotic plants of the hot house, including palms, ferns and giant water lilys, plus the beautiful architecture of the conservatories they are housed in. Choose from versatile hairpins and combs, unique headdresses and statement jewellery. Also featuring in this collection, two exciting collaborations with dress designers, putting exclusive hand crafted dress embellishments in the spotlight.